I can count myself lucky that I'm one of the 8 lucky receivers of a brand-new #GTA04A5 device! Wonder why it is so (relative) expensive compared to other main-stream phones? Because you directly invest into the very production of the device (hardware only). So you become an investor here (something like that I think) and not a regular consumer/customer. Na, not really an investor (you don't get profits back) but you pay the production of a non-mainstream device. The phone is now (longer time ago) here and there a "demo OS" on it that has the only purpose of demonstrating that the device actually works. Good, it does here. So now I need to wait for a finger-friendly OS that runs on the hardware (other CPU and so on). Pre-christmas gift: Goldelico has received test GTA04A5s! I'm the owner of an #OpenMoko #FreeRunner which I have sent to #Goldelico some weeks ago. 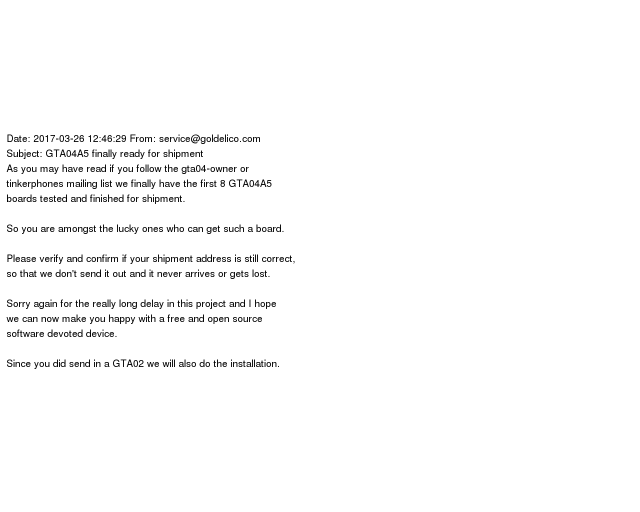 Now I received an email from gta04-owner that Mr. Schaller was able to run some tests on the first prototype boards. I'm happy to see that there is progress.